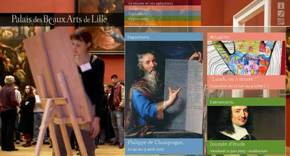 12/06/2007 — Internet — Lille (France), Palais des Beaux-Arts — After the museum in Lyon, which acquired a website late last year, another important provincial museum, this time in Lille, has implemented this indispensable tool. One finds the usual headings supplying information on the museum’s activities (exhibits, lectures, visits, workshops, etc.) as well as its collections. For the moment, only about a hundred works are online, but it is useful to know that the website for the Musées du Nord (Musenor) has a database with a large number of works belonging to Lille. This server, shared by several establishments, has a limited scope however, since it is not very flexible and is not updated regularly by the respective contributors. Several other websites are being redesigned, such as the one for Rouen or for the Prado in Madrid. The Musée d’Orsay in Paris had its site redone not long ago. Finally, we would like to point out the new website for the French “Centre des monuments nationaux” which replaces monum.fr, the “brand name” Monum having been dropped at the beginning of this year.